Crossroads Preparatory Academy Principal Kirsten Brown (left) and Dean Johnson (right), Crossroads Charter Schools Executive Director, address the audience of Downtown stakeholders on Monday evening, as they prepare to cut the ribbon on the permanent home for the senior high school. The Crossroads Charter Schools celebrated the opening its newest facility on Monday with a ribbon-cutting and tours of the permanent home of Crossroads Preparatory Academy at 816 Broadway. Located in the heart of the Kansas City’s Garment District, the Historic Thayer Building is now home to nearly 200, 7th through 10th graders. It is expected to grow to serve 600, 7th to 12th graders by 2025. Crossroads announced it would locate CPA in the Historic Thayer Building in February of this year. Since then, phase one of the building renovation has been completed, including unique learning spaces for 7th and 8th graders on one level and 9th and 10th graders on another. Future phases of the building renovation will include spaces for visual and performing arts, STEM labs, “maker spaces” and other common spaces within the building and construction of a gymnasium on the vacant land at 9th and Washington Streets. With the opening of the permanent home for CPA, Johnson said Crossroads is also seeking other partnerships that further its core values. One of those is the Crossroads Community Collaborative, an innovative community partnership that prepares students for real-world experiences. The Collaborative will supply talent to local businesses and organizations by providing integrated learning opportunities and equipping students with employable skills. There are five different Partner Levels through which organizations can join the Collaborative, including Industry Mentor, Career Host and Project Supervisor. For more information about the Collaborative or to sign up email jgreason@crossroadsschoolskc.org. Crossroads Charter Schools is a network of three schools, which offers a dynamic K-12 education in the heart of Downtown Kansas City: Crossroads Academy – Central Street (K-6); Crossroads Academy – Quality Hill (K-5): and Crossroads Preparatory Academy (7-12). Currently serving nearly 800 students, Crossroads Charter Schools offer a unique model that emphasizes community engagement and 21st Century Learning. More information about Crossroads Charter Schools is available at crossroadsschoolskc.org. Crossroads Charter Schools has identified the Thayer Building at 816 Broadway as the permanent site for Crossroads High School. The Thayer Building, which dates to the late 19th Century, continues Crossroads’ tradition of converting historic properties in the heart of Downtown Kansas City into dynamic 21st Century schools, where students engage in authentic learning through civic partnerships and access to nearby cultural and artistic resources. Dean Johnson, executive director of Crossroads Charter Schools, said the 71,000 square foot building, plus 36,000 square feet of undeveloped land at 9th and Washington, is currently under contract with an expected closing in May 2018. “The building is in excellent condition and needs only modest renovations. Students and teachers will begin classes in the Thayer Building in August 2018,” Johnson said, noting the building is large enough to accommodate both high school and middle school students. The inaugural class of Crossroads High School studies at the Downtown campus of Park University, until the Thayer Building is ready for its first class of students. “The building will open with 190 students in grades 7-10 and grow over time to serve 600 students in grades 7-12,” Johnson said. “The six-story building is large enough that we can create unique learning spaces for our 7th and 8th graders on one floor, 9th and 10th graders on a separate floor, and 11th and 12th graders on the top floor. Phase II plans include construction of a gymnasium on the vacant land at 9th and Washington. Crossroads High School opened in August 2017 with 35 9th graders in Park University’s Downtown Campus in Commerce Tower, 911 Main St. Kirsten Brown, founding principal of Crossroads High School, is excited to expand the school’s original vision to include middle school. Crossroads Charter Schools was founded in 2012 with the goal of reducing the gap between the number of “high quality” school seats in Kansas City and the number of children seeking those seats. Crossroads has grown from one school serving 190 students to three schools serving 690 students. At full-capacity, Crossroads will serve 1,300 students. Enrollment applications for the 2018-19 school year are due on Thursday, March 1. Increasingly, parents are seeking out an education with Crossroads’ core values of high expectations, authentic learning, creative culture and educational equity. “It’s our goal that Crossroads graduates are college and career ready, well-rounded, love learning, develop their full potential, are exposed to the many cultural resources of our dynamic city, and dream big for the future,” says Tysie McDowell-Ray, co-founder and Chief Academic Officer. The Crossroads Charter Schools – recently named the Missouri Charter School of the Year is now enrolling for the 2018-19 school year! Be sure to register by March 1st for the enrollment lottery. The dream of a Downtown Kansas City high school is about to become a reality. Earlier this year, Crossroads Charter Schools, a network of three schools in the heart of Downtown Kansas City, Mo., revealed the launch of Crossroads High School. 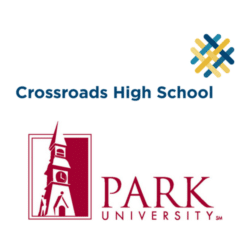 Today, Park University and Crossroads announced a partnership for Crossroads High School to utilize the University’s Downtown Campus Center as its temporary home through July 2019. This fall, the first class of 30 Crossroads High School freshmen, along with five faculty and staff, will occupy three of the University’s classrooms during the day on the third floor of the Commerce Tower redevelopment at 911 Main Street. Crossroads anticipates 70 more students will be added for the 2018-19 academic year while a permanent high school building is prepared to open in fall 2019. Also, as part of the partnership, Crossroads students will have opportunities to visit the University’s flagship campus in Parkville, Mo., to gain additional exposure to college life. Crossroads will host an open house for its students and parents on Friday, June 9, from 5 to 6:30 p.m. at Park’s Downtown Campus, to provide a sneak peek of the opportunities they will have to engage in the downtown community and its accessibility to the city’s streetcar line, which has a stop outside the building. “We are excited that Crossroads students will expand their studies in this newly renovated, high-tech, university setting,” said Dean Johnson, executive director of Crossroads Charter Schools. Crossroads opened its first elementary school in 2013 in an office building in Downtown Kansas City and by 2017 enrolled roughly 570 students in kindergarten through eighth grade in two Downtown locations. Kirsten Brown, a current teacher at Crossroads, will be the founding principal of Crossroads High School. 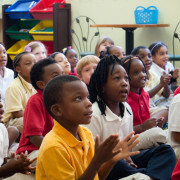 For more information about Crossroads Charter Schools, visit www.crossroadsschoolskc.org/. To read more about the Crossroads High School announcement, visit The Kansas City Star at http://www.kansascity.com/news/local/article152737769.html and The Kansas City Business Journal at http://www.bizjournals.com/kansascity/news/2017/05/25/crossroads-high-school-temporary-location.html. 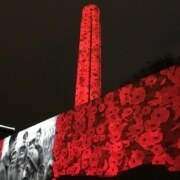 Do you have school age children and live Downtown? Then you may be interested to know that the Crossroads Academy of Kansas City, located at 1011 Central in Downtown Kansas city, is enrolling grades K-8 for the 2015-2016 school year. Open enrollment lottery deadline is March 31. Applications can be found at www.crossroadsacademykc.org. All enrolling families must live within the KCMO public schools boundaries. Of these families, those that live or work in the Greater Downtown Area receive priority in our admissions lottery. Crossroads Academy of Kansas City is a tuition-free charter school located in Downtown Kansas City, Missouri. Their mission is to prepare students to excel in high school by providing an academically rigorous K-8 education. The school opened in 2012 with 190 students in grades K-5 and will eventually grow to serve 370 students in grades K-8. Their mission is to develop graduates who are scholarly, culturally literate and service- oriented individuals who will pursue their dreams relentlessly and have a positive impact on their family, their community and the world. Immersed in the civic, artistic, financial and historic heart of Kansas City, Crossroads Academy embraces the exceptional learning opportunities of our urban setting. The Crossroads Academy charter school in Downtown will christen its new middle school facility at 1011 Central on Wednesday morning, and you are invited to the ceremony. 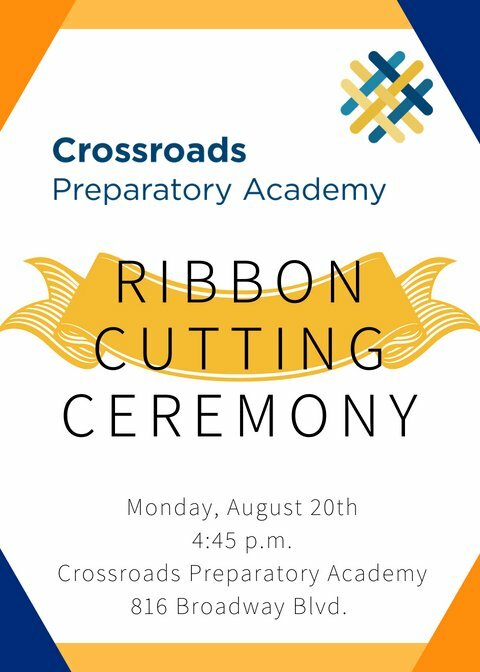 The Crossroads Academy will officially open its new Middle School building at 1011 Central with a public ribbon-cutting ceremony, and you and your colleagues are invited to attend. Central at 8:45 for the Ribbon Cutting, followed by student-led building tours. During the construction project, 1011 Central was transformed from a former office space into a 21st Century Middle School and STEAM (Science, Technology, Engineering, Art and Math)-based facility, according to Executive Director Dean Johnson. The building now features fifth grade classrooms, Middle School Learning Studios, Science Labs, Visual Arts Studios, Performing Arts Studio, multiple Common Areas and Study Rooms along with a Multipurpose Room. 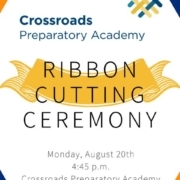 For more information about the Crossroads Academy or about Wednesday’s ribbon-cutting, visit the school’s website at crossroadsacademykc.org. Six old-fashioned lemonade stands will dot the Downtown landscape on Wednesday, Aug. 27, as Crossroads Academy students take to the streets to sell cups of refreshing, cold drinks. Crossroads Academy students and teachers will be selling lemonades at six Downtown street corners over lunch on Wednesday. This week’s hot summer weather is perfectly timed, as the students at Downtown’s charter elementary school play host to the lemonade stands from 11:30 a.m.-12:30 p.m. tomorrow. Make plans now to take time out during lunch on Wednesday to stop at one of the stands and purchase a cup of lemonade for $1. 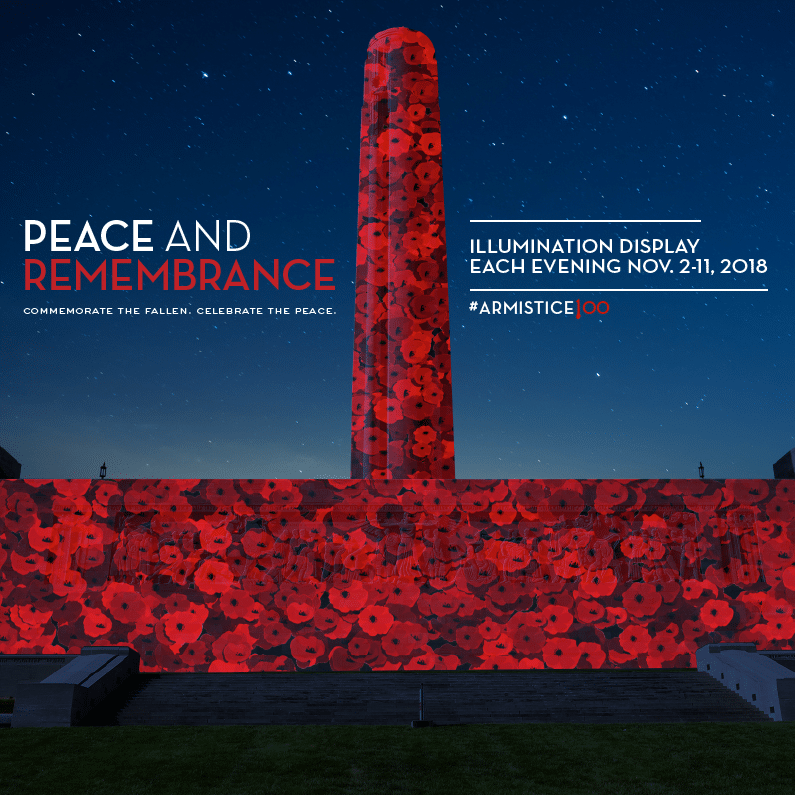 An interactive map of the stand locations is available on the Crossroads Academy’s website.